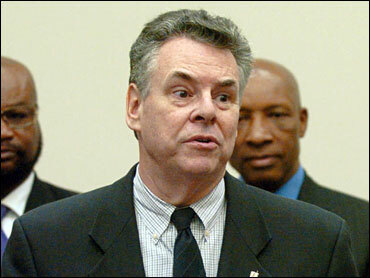 Rep. Peter King Planning Hearings on Muslim "Radicalization"
Republican Rep. Peter King of New York plans to hold hearings in Congress next year on the "radicalization" of Muslim communities, his office confirmed to the Hotsheet. As first reported by the New York Times, King is planning to hold the hearings once he takes up the chairmanship of the House Homeland Security Committee. He says the hearings are planned in response to complaints from law enforcement officials that Muslim leaders have been uncooperative in terror investigations. "When I meet with law enforcement, they are constantly telling me how little cooperation they get from Muslim leaders," King told the Times. "It is controversial. But to me, it is something that has to be discussed." The hearings come at a time of increased concerns about "homegrown" Muslim terrorists - along with persistent fears that innocent Muslims have been unfairly targeted since the Sept. 11, 2001 terrorist attacks. Muslim leaders told the Times they have strong concerns about King's proposed hearings. "We are disturbed that this representative who is in a leadership position does not have the understanding and knowledge of what the realities are on the ground," said Abed A. Ayoub, the legal director for the American-Arab Anti-Discrimination Committee. He added that King's proposal "has bigoted intentions." A CBS/ New York Times poll released in mid-September showed that as many as 20 percent of Americans said they have negative feelings toward Muslims because of the September 11 terrorist attacks. In September, anger over the role of Muslims in the United States came to a head over the so-called "Ground Zero mosque," an Islamic community center that organizers wanted to construct a few blocks away from the site of the 2001 terrorist attacks in New York. "We need to make sure that we stand for civil liberties, so we can deprive people like Osama bin Laden of the claim that Muslims are poorly treated in America," Rep.Keith Ellison (D-Minn.), the first Muslim member of Congress, said on CBS' "Face the Nation" at the time. "The United States is not at war with Islam." King was one of the leaders who opposed the building of the Islamic center, and he has been criticized before for what critics say amounts to inflating the risk Muslim leaders in the U.S. pose. National Security experts do acknowledge that the risk of "homegrown" terrorists has increased. "There is a risk of Americans seeing something in the al Qaeda worldview," National Counterterrorism Center director Michael Leiter said on CBSNews.com's webshow "Washington Unplugged." That risk has increased this year, he said, though he added, "I think it's still too early to say that we have a trend." Leiter stressed that the Muslim American community is diverse and a part of every aspect of life in the United States. "It has been only a tiny, tiny percentage of Americans -- increasingly more this year, but still a tiny percentage of Muslim Americans -- who have for a variety of reasons found appeal in this al Qaeda ideology," he said. King told the New York Times he would invite Muslim leaders to his planned hearings.